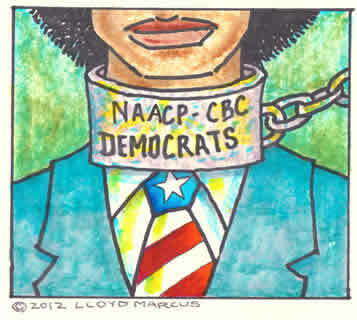 Lloyd Marcus -- When Will the NAACP Truly Help Their People? Upon reading a post election article in which the NAACP is all fired up about supposed black voter suppression, my response was when will these people ever seriously do something to help black people? Folks, I am sorry, but the NAACP and others in their civil rights syndicate are a despicable bunch. All they really care about is furthering Liberalism and increasing their political power. They are disgusting. In their typical we know we can count on the MSM to help us “play” black voters and portray Republicans as the modern KKK, the NAACP and their race-baiting posse are insisting that the newly elected congress pass a robust Voting Rights Act Amendment. Charlie Rangel tried to scare blacks to the polls by saying that the GOP wants to return blacks to slavery in America. This is trash folks. This evil little man is a disgrace. First lady Michelle Obama tried to bribe blacks with a reward of fried chicken for their vote. Heck, why didn't Michelle throw in permission for blacks to indulge in an extra large slice of watermelon for dessert? A white politician making the same offer to blacks as Michelle would be tarred, feathered and run out of DC on a rail. When will black Americans wake up and smell the condescension, manipulation and exploitation coming from the Democrats; fronted by black traitorous operatives. Urban blacks are finally beginning to smell the betrayal of so-called black advocates, white liberal socialist/progressives, the Democrats and Obama. Meanwhile, black Democrat operatives are running around trying to destroy and silence non-whiny successful blacks; laser focused on delivering blacks to the polls every election cycle scared and angry at whites. Black retired gifted neurosurgeon Dr Ben Carson gained international fame for his groundbreaking work separating conjoined twins. Carson came from humble beginnings raised by a single mom. What if Carson was amoung the extremely high number of black abortions? Could a brilliant black baby destined to cure Cancer have already been aborted?